On the way home from his latest mission, secret agent Kangaroo's spacecraft is wrecked by a rogue mining robot. The agency tracks the bot back to the Moon, where a retired asteroid miner—code named "Clementine" —might have information about who's behind the sabotage. Clementine will only deal with Jessica Chu, Kangaroo's personal physician and a former military doctor once deployed in the asteroid belt. Kangaroo accompanies Jessica as a courier, smuggling Clementine's payment of solid gold in the pocket universe that only he can use. This sequel to Waypoint Kangaroo gives equal thrills in a closer, more character-focused story. Kangaroo has gained confidence since the events of book 1, but he still wields his trademark quips and a certain, youthful insecurity. He knows the world around him has become if anything more dangerous since his mission on the cruise-spaceship to Mars, as one of the biggest threats from that book is still wreaking havoc with insider knowledge about the agency. 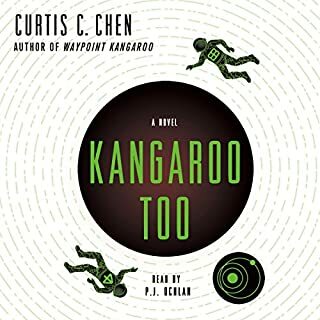 Kangaroo Too send Kangaroo and his long-suffering doctor, Jessica "Surge" Chu, are sent to the moon to meet a mysterious contact who might have clues about robots going rogue. Along the way, Kangaroo will have to negotiate what it means to trust when you work for an agency that is all about secrets, and to team up with people he wants to hate. The conflicts and fight scenes are dynamic, and the situations complex yet utterly believable within Kangaroo's world. Curtis Chen's deft writing continues to convey humor and tension on every page. The voice performance is good and clear--great for Kangaroo's voice--and has good differentiation for the other characters, though his "female" voices are a little similar to one another and a bit grating. Still, a very fun listen overall. What happens when an unprecedented infection sweeps the world, leaving the earth on the brink of the Apocalypse? This infection goes far beyond disease. Beyond even the nightmare images of walking dead or flesh-eating ghouls. The infected are turning into creatures unlike anything ever dreamed of ... more complex, more mysterious, and more deadly. Trapped in the northwestern United States as winter begins to fall, Terry and Kendra have only one choice: they must cross a thousand miles of no-man’s-land. 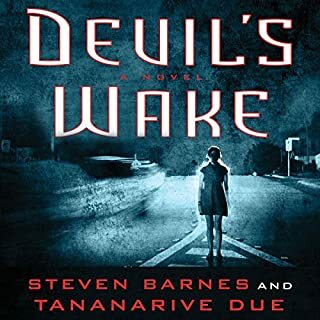 What did you like best about Devil's Wake? What did you like least? Great characterizations with very believable teens who interact with the few adults in their post-zombie-apocalypse lives in a really reasonable fashion while still carrying all the bittersweetness and impulsivity of those pre-adult years.Fantastic reading performance.I really REALLY disliked that it was only part of a story. It seemed pretty blatantly incomplete. There were no character arcs completed, and the title is just the name of a place a few of the characters want to go. They don't even get to any of their alternative destinations, or interact with any of the people whose voices have guided them on their journey. It stops basically at one of the pit stops along the way, an entirely temporary place.Basically, selling this as a complete book seemed cynical. I'm not sure I want to pay for another one. Would you recommend Devil's Wake to your friends? Why or why not? Warning them that the book is only the first part of the story, yes. Was Devil's Wake worth the listening time? half-and-half. Great, but woefully incomplete. Even the first hint that this is the first part of a longer story would have made me feel less ripped off. This doesn't even qualify as the start of a trilogy. It's more like they just chopped the book off when they had enough words. Would you try another book from Greg Bear and/or Dan John Miller? I have enjoyed several of Greg Bear's books. Greg Bear does a strange thing with the ending of this book, jumping to the conclusion before going back and finishing the tale of how the characters get there, effectively draining the tension out of an otherwise well-put-together story right at the end. I'm pretty new to audiobooks. This seemed like a good performance. Sometimes the narrator's "woman's voices" grated on me a bit, but I'm not sure how that could be improved. 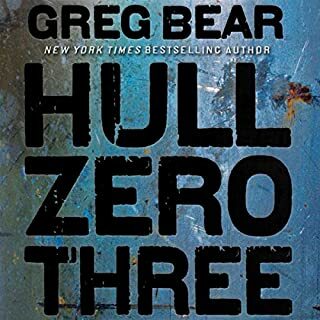 Do you think Hull Zero Three needs a follow-up book? Why or why not? I think the concepts Bear introduced were covered thoroughly here.